Ever wanted to dance and later simply sit out in the open air and sip cocktails all at the same place? 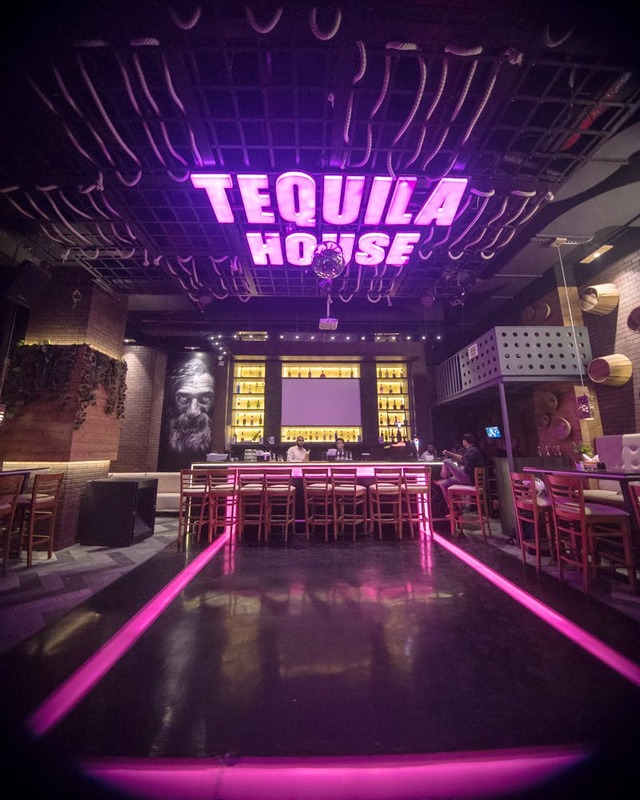 Well, Tequila House Lounge in Kharadi's World Trade Centre offers just that. You can drink, eat, dance and have a great time with your group here. The interiors are dim-lit, there are tyres hanging around with live plants in. Half wooden barrels jut out from the wall, so does half a motorcycle. And the bar extends into a dance floor that’s lit in neon purple with a big tequila house neon sign on the ceiling too. The lounge is clearly going for a grungy look. But the dining area tells a different story. It’s mostly white and blue, and very pristine with cute light fixtures, flowers for centrepieces and whatnot as though you’re suddenly at a fine-dining space. The menu offers a range of classic and in-house cocktails. We don’t see tequila dominate the bar, but there are some tequila cocktails to sip on and the price isn’t too bad either. We loved the cucumber basil collins, punch blaster and pink lips. The cocktails are potent and well shaken. The food menu includes everything from quesadillas, pastas, Chinese appetisers and mains to kebabs and Indian curries and gravies. They have extensive seafood dishes, so order up a tandoori pomfret, the tainese chicken comes on a bed of fried noodles and has a sweet soy flavour. For vegetarians, the chef plates up a rich paneer makhanwala or you could opt for something lighter like the Italian wild mushroom, which has different mushrooms and pasta cooked with lots of garlic. A meal for two here, will set you back INR 1,500 with alcohol. We would have loved to see ore tequila focused cocktails and mixes on the menu. And maybe some drunken food, doused or flambe with tequila too. Head here for their affordable prices, it’s a great place to drink on a budget with friends.